Note: This post was recently published on the St. John's Prep GOOD to Go blog. Chad Konecky interviewed me and wrote the post based on our discussion. Demonstrating and reinforcing common-sense social media engagement is important, especially when it comes to adolescents and teens. Kerry Gallagher, St. John’s assistant principal for teaching and learning, is leading the Prep’s emphasis on developing best practices when using social media. Interestingly, the challenges of building an online identity can become even more difficult if students and their parents choose not to use social media, explains Gallagher. Alternatively, when students do create an online presence, it can become an opportunity to learn how to act appropriately and with accountability. Gallagher offers three “startup” principles for students and their parents as young people reach the age of 13 and wade into the wellspring of social networking. These principles revolve around being authentic online, understanding that anything you post should be considered permanent, and learning to discern the accuracy of what you read online. “Ideally, whenever they engage with social media, the boys should be asking themselves: ‘How am I helping my future?”, advises Gallagher, who is also chair of the EdTech Committee at St. John’s. 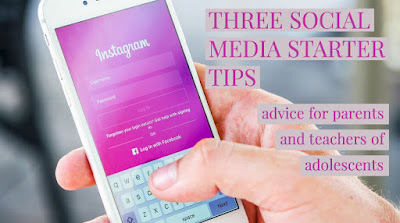 “In other words: ‘Think of social media as an online resume of your interests and activities.” She notes that students’ online identity should be one of kindness, respect and an authenticity. St. John’s goal is to reinforce that message at every available opportunity, particularly when it comes to communicating that anything you post is permanent. An array of tools, tips and classroom examples underscore the notion that online activity is indelible. In addition to taking ownership and responsibility for what they post online, users should always carefully assess the content and context of what they share, avoid posting on the fly, and remain sensitive to any perceptions or misperceptions that might result. But there’s a deeper layer. “Urban myths, meaning ‘facts’ or stories that aren’t true, can spread easily on social media when users don’t verify the details,” says Gallagher, who has partnered with the Yale Center for Emotional Intelligence to create strategies for building fact-checking skills into the classroom experience at the Prep. “Research consistently shows that when we see a ‘fact,’ we tend to believe it if it supports how we’re feeling at the time. That’s our emotional intelligence as opposed to logical, critical thinking. I needed a custom made order they will don’t appear to offer you typically on their own website store, so I contacted them. buy youtube views responded quickly and taught me to a good offer I do not know, maybe I would buy it elsewhere a little bit less expensive, but Famouz.io did actually have better assistance and to be dependable as competitors. I needed to make certain that nothing goes completely wrong; it was a rather major order for my cardboard general.